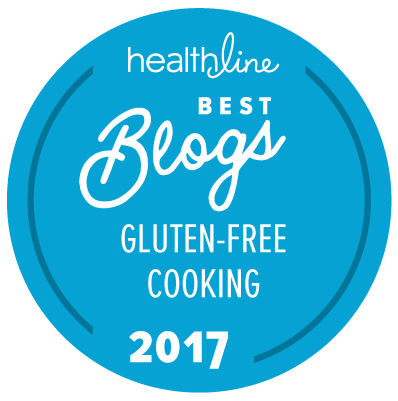 To get weekly Gluten-Free Recipe of the Week updates, subscribe to the blog's RSS feed. Heat barbecue to medium-high. Rub steaks with a little olive oil. Season with salt and pepper. Cook steaks for 4-6 minutes on each side, or until cooked to your liking. Set aside to rest and cool. Segment oranges over a small bowl. Reserve the juice in bowl. Spread out lettuce leaves on a platter. Top with carrot, red onion slices, orange segments and mint. To make dressing, whisk together reserved orange juice, garlic, olive oil, salt and pepper. 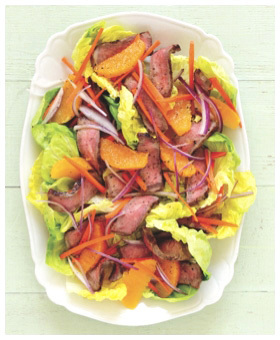 Slice steaks thinly and place onto salad. Drizzle dressing over salad and serve. In a baking dish, season catfish fillets all over with lemon zest, lemon juice, Old Bay, garlic salt and cayenne. Heat cast iron skillet over medium-high heat. Once hot, add oil and then cook catfish for about 2 minutes on each side, until nicely browned. Place the skillet with the catfish in the oven and cook until flaky and crisp around the edges, about 15-20 minutes. Season with salt and coarse ground black pepper and serve with a lemon wedge for garnish. *Always check the label to ensure your ingredients are gluten-free! 2. Roughly break up cookies in your fingers and process in food processor to crumbs. Add brown sugar, cinnamon and nuts and process until finely chopped but not ground. Add butter and run to mix. The mix will look moist, but not a dough. Spread into greased 9” x 13” pan and press with hand or spoon to form a firm base. 3. Bake in 350° oven for 20 minutes, remove from oven and cool completely. It will crisp up as it cools. 1. Combine cream cheese, powdered sugar, vanilla and honey in a 6-8 cup bowl. Beat until smooth. 2. Heat gelatin and water mixture in microwave for about 10 seconds until totally dissolved and looking like a pale yellow-brown liquid. You must make sure all the gelatin is dissolved otherwise it sets into little rubbery lumps. Whisk into cream cheese mix. 3. Whip the 2 cups of cream until stiff in a separate bowl and gently whisk into cream cheese mix. (Add thawed cool whip now instead of cream if that’s what you decided to use instead of real cream.) Taste and see if it is sweet enough for you. If not, add some powdered sugar 1 T. at a time and gently beat in. Spread over cooled crust. 4. Place blueberries touching in a square about 4” x 4” for the stars. Place halves or whole strawberries (depending on size) touching to make the red stripes on the ‘Stars and Stripes.’ I try to squish in as many strawberries as possible in rows. I don’t leave a space between the rows. 5. Using a star food tube, pipe stars of cream in the blueberry square. Pipe lines of stars between the rows of strawberries to create the white stripes Pipe cream around the outside edge of pan and around the inside edge of blueberries to finish it off. 6. Refrigerate for about 2 hours before serving. If you are new to gluten-free, replace your old electric hand mixer since flour can be stuck in vents ready to fall into food. Also, be aware that many new mixers do not have stainless steel beaters, so they will rust if you put them in the dishwasher. I use gelatin to stop the cream cheese mix from flopping in the heat. Gelatin doesn’t make mix hard; it just holds it together better. You can leave the gelatin out, if you prefer. If a 9” x 13” dish is too much, you can easily make just half in an 8” x 8” brownie pan. Use half in a 9” or 10” pie plate and put strawberries and blueberries in circles. Even cereal bowls, custard cups or ramekins can be used to make this recipe fit your needs. To double check what pan will fit, pour water into an 8” x 8” pan or 9” x 13” pan and count how many cups of water it holds. Choose the pan you would like to use, measure that with water and then do the math on paper to see how much to decrease recipe by. Just make sure that whatever dish you use, it is oven safe since you will be baking the crust. You’ll need a bunch of wooden skewers, soaked in water or a broth for 20-30 minutes to minimize burning on the grill. 1 or 2 shallots, peeled, cut into cubes as well. Soak the skewers and set aside. After cutting the salmon into pieces, place in a bowl with the 1 Tbsp. melted butter, paprika, black pepper to taste, and 1 Tbsp. of lemon juice. Turn the salmon to coat on all sides. Cut the shallot and bell peppers and add to the bowl and combine so they also get a taste of the liquid. Thread the salmon on the skewers, alternating with the onion cubes, pepper slices. Try to end each skewer with a bell pepper piece, which helps keep the salmon on while grilling. On the hot grill, cook for about 3 minutes per side. Watch that your grill isn’t too hot as they burn easily. Place on a plate and cover with foil to stay warm while you make the sauce. In a small saucepan, place the remaining butter, the wine, and about 2 Tbsp. fresh lemon juice. Simmer for about 5-6 minutes, stirring well as it reduces a little. At the last minute, add the chopped parsley. Remove from heat and pour onto each plate, placing the skewers of cooked Salmon & veggies on top. In each of four parfait glasses, spoon 2 Tbsp. yogurt, 2 Tbsp. crumbled bar, ¼ cup berries, another 2 Tbsp. yogurt, 2 Tbsp. berries, and any remaining granola. Drizzle each parfait with 1/2 tsp. honey. Serve immediately, or cover with plastic wrap and refrigerate for up to 3 hours before serving. Place eggs in a medium saucepan with enough water to cover eggs by 2 inches. Bring to a boil, cover, and remove from heat. Drain, and fill saucepan with ice cubes and cold water. Set aside to cool in water for 10 minutes. Drain water and peel eggs. Slice each egg in halve lengthwise. Place yolks in a small bowl and mash with a fork until smooth. Add yogurt, cilantro, parsley, sea salt and pepper. Pipe or spoon filling into empty egg whites. Sprinkle Parmesan cheese onto each deviled egg. Bring several inches of water to a boil in a large saucepan fitted with a steamer attachment over high heat. Add potatoes to steamer and cook until tender and flesh feels tender when pierced with a fork, about 15 minutes. Remove potatoes and steamer transfer to a large bowl. Drizzle vinegar over the potatoes and toss to coat. Refrigerate until chilled, about 1 ½ hours. Whisk yogurt, mayonnaise and salt in a medium bowl. Stir in cheddar and mix until any clumps of cheese are broken up. Stir in the celery hearts, onion and herbs. Stir yogurt mixture into the cooled potatoes and season with pepper. Meanwhile, using a mandolin slicer, slice beets into wafer-thin rounds. In a large bowl, toss beet slices with cornstarch. Fry the beets in the oil in batches, being careful not to overcrowd the pan. Cook 3-4 minutes, transfer cooked chips to a cookie sheet lined with paper towels. For the aioli, combine chipotle peppers with mayo. Place into dipping bowl and serve with beet chips. Bring water to boil in large saucepan. Add broccoli; cook 1 1/2 minutes or until tender-crisp. Rinse under cold water; drain well. Mix chili sauce, lime juice and salt in large bowl with wire whisk until well blended. Add broccoli and carrots; toss to coat well. Cover. Refrigerate at least 1 hour or until ready to serve. Begin by starting your homemade relish. Turn the burner on medium low and begin by simmering your cut up onion. Once onions are translucent, put in the red wine, balsamic vinegar, red wine vinegar, and the brown sugar. Let simmer until it smells all sorts of wonderful. Once done, put in a bowl and set aside. While your homemade relish is simmering, place the cumin seeds in a skillet over medium heat for 3-4 minutes. Then place onto cutting board and crush with a rolling pin so it will easily coat the beef hamburger patties. Grill the slices of pineapple from the can for 3-4 minutes per side. Take off the grill and cut into smaller pieces on a cutting board. Place into bowl with homemade relish. Brush or spray the hamburger patties with olive oil and then coat with the cumin seeds, doing your best to make both sides even. Place burgers on the grill to cook evenly, approximately 5 minutes per side. Take burgers off of grill and place on a gluten-free bun with fresh basil. Top the cumin-coated burger with the homemade relish and pineapple. Place on a plate with your desired side dish (we made grilled steak fries) and eat your gluten-free heart out! Want more gluten-free blogger recipes? Sign up to receive a free downloadable eCookbook, featuring this recipe and others highlighted in the Crunchmaster Food Photo Face-Off.